I was inspired by some Swiss Hazelnut Ice Cream I recently had, so I added Nutella and coffee to my regular buttercream recipe for that hazelnut taste. Next time I think I will roast the hazelnuts and ground them up to a maize, then add them to the buttercream. They were still good though! Hi! I just found your blog through a comment you left in the Idea Room re: Lightscoop. :) Does the kleenex over the flash really work? I should try it one of these days. Anyway, I love your blog so far. Lots of cupcake goodness and ideas. 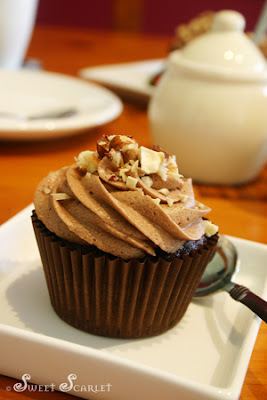 I actually just made some cupcakes with nutella frosting this past weekend and they were yummy! I was going to add a bit of coffee to them, but wasn't sure how they would taste. Maybe I'll try it next time. And if you ever have a chance, visit my etsy shop: hugaroo.etsy.com. I make garlands and such if you ever need any. Looking forward to future posts! Oh wow, these are some gorgeous cupcakes. REally, how can you go wrong with these flavours?? ?